The Vapor Street sports Nike’s React foam. Yes that’s right. The Epic React was not the first Nike running shoe to use React. The Vapor Street had several months ahead of the Epic React. The Street sports an 8mm drop, 2mm lower than the Vaporfly Elite, and does away with the carbon plate. The result of using the firmer React foam and the lower drop is you don’t get that tipping over sensation when you stand around in the shoe. The upper uses a combination of inelastic and elastic knit fabrics to achieve its fit. The knit for most of the shoe is inelastic but not rigid and provides a pretty good wrap of the foot. The elastic portion sits in the middle and replaces the traditional tongue, and stretches to accommodate your foot. The execution of this upper is infinitely better than that used in the Epic React in my book. No break-in period. Just put it on and go. There is no heel cup in this shoe. Instead, the heel tab is reinforced to get some semblance of rigidity against the heel, and two pockets of cushions are woven into the heel collar on either side of the midline. You will not get any Achilles irritation with this shoe. Despite its looks, the upper breathes very well, partly I think, due to the coarser thread being used, compared to e.g. Epic React, and the result is larger pores in the knit matrix when your foot slides in and stretches things out. As for the fit, it sits somewhere between true to size and a half size down depending on your preference. I have the Vapor Street in both true to size and a half size down, and while you get a more snug racing fit with a half size down, I prefer true to size for my easy runs. If in doubt, always go with the bigger size. Overall shoe volume is middle of the road for me. It does feel snug around the heel and midfoot when you wear it, but in no way does it ever feel constrictive. Toe box volume is similar to the Vaporfly 4% at true to size. The sockliner can cause a little heat build-up from time to time, and while it does not bother me for runs up to an hour, I think I would switch it out to a more ventilated sockliner for longer runs. The midsole uses a single density block of React Foam, that seems to be a similar durometer to that used in the Epic React. Here is where things get a bit tricky. The outsole rubber coverage is not very thick, and the compound used seems to be a little firmer than that used in eg Vaporfly 4% and Zoom Fly. The result is something that does not provide quite as much grip as the Vaporfly and Zoom Fly, but is generally adequate for running on roads and concrete. I would be wary of using it on any sort of wet dirt. There is also very little outsole rubber in the heel, as the outsole design is essentially the same as the Vaporfly Elite, so heel strikers may want to take this into consideration. Bouncy is the best way to describe the ride of the Street, with a level of cushioning and softness somewhere between the Skechers Ride 7 and the Epic React. You just feel like there is a lot of cushioning underfoot, and yet the lightness of the shoe allows you to pick up the pace quite easily. Ironically, because React is a firmer material than Zoom X, I find that it has a little more pop at toe-off than the Vaporfly 4% when you want to pick things up. The heel is very forgiving by Nike standards, with a lot more give and vibration dampening, which is a rarity for Nike shoes in this weight class. This is the best execution of the flyknit upper I’ve ever tried, and it just moulds to your feet so easily that you hardly notice it. It is extremely smooth at moderate to uptempo paces, and I often alternated between the Street and my trusty Zoom Fly SPs for my uptempo runs during my last marathon training cycle. Even at slower paces, the lack of the carbon plate, allows the shoe to be a little more flexible and more forgiving in the heel, which makes it a much more versatile shoe than even the Zoom Fly. If there is one knock on the shoe, it is that this shoe has zero stability elements, and given the fairly narrow last at the heel and midfoot, can be a little squirrelly around sharp bends for non-forefoot strikers. 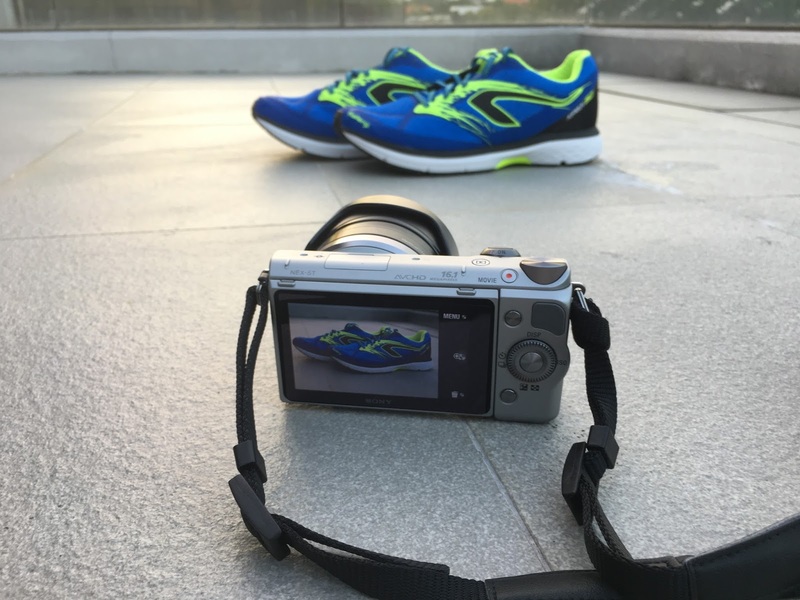 If your runs are fairly non-technical, then this shoe will work like a dream. I have about 150km in my first pair of Vapor Streets (black), and you can just about make out a little bit of outsole wear on the forefoot, but I have been careful to use it on well paved surfaces and never on gravel. I think grip may be a bit lacking on wet surfaces (especially soft ground or grass), so take that into consideration. I can easily see the Street being evolved into a new version of the Zoom Elite 10, with a little tweaking to the outsole. Overall, I have been thoroughly impressed with the Vapor Street, and while it may have been designed to be a lifestyle shoe, it can certainly handle some road running. I really like the aesthetics as well, and that never hurts. So there you have it, a maximalist lightweight trainer from Nike that is doing everything I wanted in a Hoka Clayton, but in a prettier package. The shoe retails locally in Singapore at the Dover Street Market in Dempsey, as well as a few other online retailers. At S$259 locally, it is on the pricey side, but when you consider the retail cost of a pair of Zoom Fly’s, S$259 becomes a much smaller leap. The Street has a "spongier" feel overall, and a distinctly softer feeling heel than the Zoom Fly. I think the Zoom Fly still feels faster because it has a faster transition at uptempo paces, but the Street is more forgiving over a wider range of paces. There is no question the Vaporfly is the superior shoe. Zoom X is simply soft, smoother and bouncier than React as a material. Having said that, the Vaporfly upper can be a bit sloppy, and i prefer the wrap and hold of the Vapor Street knitted upper. Both shoes use the same React foam, but the Street feels more cushioned, and has an overall softer feel across the entire shoe. The Street Upper is also much more accomodating to different foot shapes, and requires no break-in period. I prefer the Vapor Street. - 0.3 for outsole material choice. Could improve durability and grip by using the same outsole rubber as the Zoom Fly. How would the sneaker do on a treadmill ? What a wonderful post and information.. Thank you so much for sharing this post..
Wow, it's beautiful pictures.Thanks for sharing this post.